It’s not common for a GPU vendor to launch a brand-new series and it turn out to be underwhelming, but I think it’s even more uncommon when a new series manages to genuinely “wow” us. With its GTX 900 series, NVIDIA has successfully landed itself in the latter camp. Not only does Maxwell bring some great features, but the GTX 980 turned out to be an absolute powerhouse. But what about the GTX 970? As much as I hate to admit it, this is a card I underestimated. When I took a look at the GTX 980 last week, time prevented me from being able to test out the GTX 970. Even after taking into account the GPU’s specs, I couldn’t truly appreciate what it offered until I got to testing. After a single 3DMark run, I found myself experiencing that “wow” feeling all over again. So as to not spoil everything in the intro, let’s take a look at the card at hand, and then see how it compares to the big gun, the GeForce GTX 980. 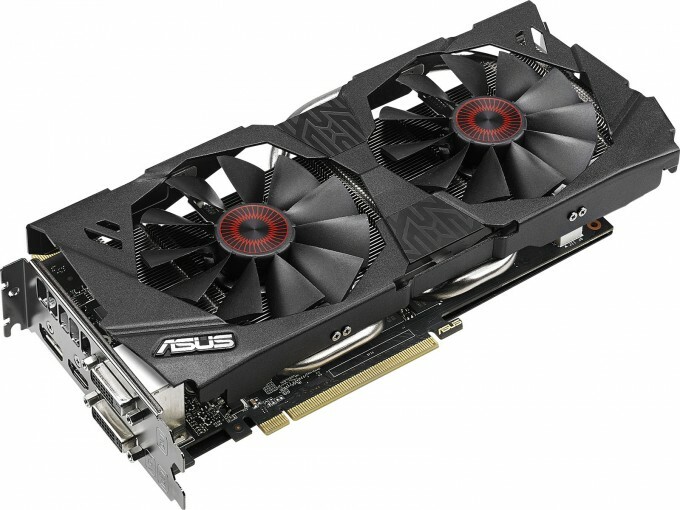 The first GTX 970 to hit our lab is ASUS’ Strix, seen above. With its capability of being able to provide 0dB gaming, the series’ name is surely related to Strix owls, AKA: earless owls. 0dB gaming is impressive, but so is the factory overclock that ASUS says will boost performance by 7.6% over a reference model. It might be a good idea to tackle that promise of 0dB right now, because after all, a promise like that for a card this powerful seems like a pipe dream. In actuality, though, the feature is very simple: The fans won’t turn on until a certain temperature threshold (65°C) is reached. For high-end games, it’s highly unlikely that you’ll ever see the fan sit idle, but for others – especially MOBAs and more casual games – the GPU will in many cases be competent enough to deliver consistently high framerates but remain cool enough to keep the fans stopped. I’m sure it goes without saying, but for the best results with this feature, your chassis should have very efficient airflow. If you toss this card into a SFF chassis, for example, it’s highly unlikely that that card will ever stop its fans. In a mid- or full-tower, though, the opposite will be true. For those worried about stopped fans killing the card quicker – don’t fret. Like the past couple of GeForce generations, the GTX 900 series is designed to run at a constant 80°C, a point at which the fans on this card would be running. Beyond that 0dB perk, ASUS once again delivers a robust power solution with Strix. For starters, what might stand out immediately to most people is the fact that the card draws its power from a single 8-pin PCIe connector. Those who appreciate keeping their installs clean will no doubt appreciate this feature, as it completely rids the second cable. Further, the card has a number of high-end components onboard, including Super Alloy MOSFETs, capacitors, and chokes, as well as ASUS’ much-touted DIGI+VRM power-handling chip. The components used might not matter to you, but the promise of great overclocks might. On paper, the reference GTX 970 is quite attractive when compared to the 980 which costs $220 more – that’s an effective 66% price premium for 23% more cores and a 75MHz clock boost. Not to downplay the impressiveness that is the GTX 980, it’s hard to ignore the fact that two GTX 970s can be had for $660 SRP – that would then be a 20% price premium for a 63% gain in theoretical performance. 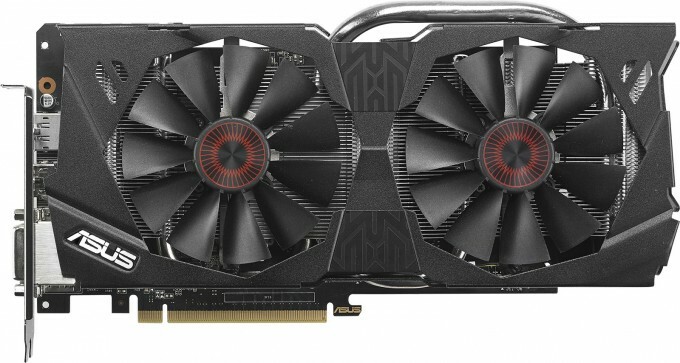 The GTX 970’s reference clock is 1,050MHz, and because Maxwell proves to be so overclockable, ASUS saw it fit to boost its Strix edition to 1,253MHz. With boost, the card can peak at about 1,300MHz. The memory speed was left intact at 7GHz, which doesn’t matter a great deal – in testing, I have found boosts of 500MHz and more to make very little difference. In normal overclocking, it’s best to focus on the core clock, and then adjust the memory clock if you’re in the mood. 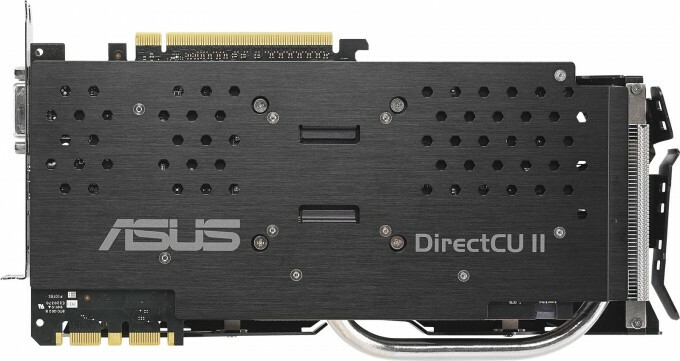 On the power front, the GTX 970 is spec’d at 145W. 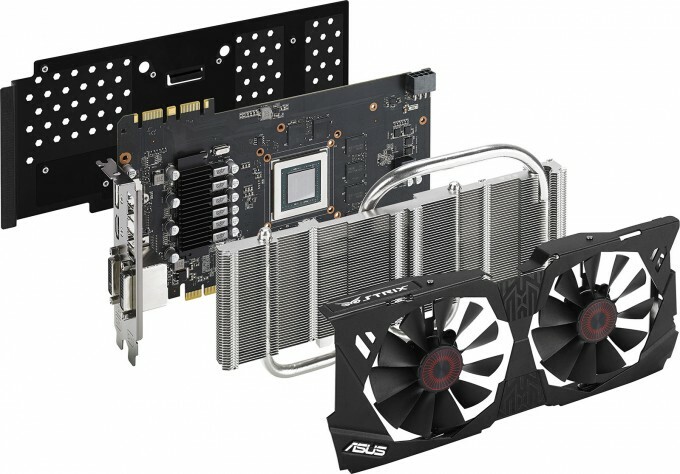 As we’ll see in the results on the pages ahead, ASUS’ variant matches or surpasses the 780 Ti – a card spec’d at 250W. I harped enough on the impressive power-efficiency of Maxwell in the launch article last week, so there’s no point in continuing to drum on about it here. A robust cooling solution would be expected given the promise of 0dB gaming, and that’s just what we’ve got. At the back of the card is a backplate for improved heat dissipation, and under the fans at the front is a large heatsink with two very thick pipes. ASUS has decided to go with a different video port configuration than NVIDIA’s reference (which is 3x DP, 1x HDMI, and 1x DVI), instead opting for a more typical arrangement: 2x DVI, 1x DP, and 1x HDMI. With the card and its perks covered, let’s get a move on.